Posting shows, that's how! Shows #231 through #240 are finally up -- and that includes interviews with Larry Polansky, Peggy Madden, Masahiro Miwa, Belinda Reynolds, and Peter Garland. Not only that, but we've added interview clips on the pages of Howard Fredrics, Michael Frengel, Sarah Peebles, Matthew Fields, Larry Polansky to complement recent interview highlights with Jon Appleton, Peter Beyls, Rhys Chatham, Christopher Koenigsberg, John Levin, and Benedict Mason. These join Louis Andriessen, taken from his AmsterDramm appearance, David Behrman, James Bohn, Craig Bove, Allison Cameron, Kyle Gann, Elma Miller, Pauline Oliveros, Linda Catlin Smith, Ann Southam (whose complete interview is transcribed as well), and the late Peter Van Riper. Speaking of Shoutcast, Kalvos & Damian also has a website on MP3.com -- check out the K&D station of MP3.com for a four-hour hi-fi rotation of pieces by show guests. 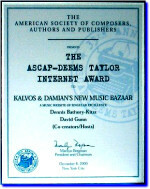 ...to contribute to Kalvos & Damian's New Music Bazaar before the end of 1999. K&D is a project of the Vermont Contemporary Music Ensemble, a 501(c)3 corporation. Support may be sent to K&D/VCME at 176 Cox Brook Road, Northfield VT 05663 USA. Contributions represent 15% of the K&D budget (the rest of which is provided by the co-hosts). We'd like to change this ratio! Please help us out so we can spend more time making this show & site valuable. Here is our 1998-99 Report to Contributors and here is our 1999 Supplement. More information is found on our funding page, or you can send us email asking questions about funding. Read the news! New clips + tunes! This week! Larry Polansky is our guest with the first-even broadcast of the complete recording of "Lonesome Road", and 74-minute set of piano variations! Don't miss it! We're also getting ready some other cool special shows -- one on acousmatics prepped by Ian Chuprun, and more than a dozen interviews we'll be taping in New York City in January. Our latest K&D Newsletter is done, though we haven't had time to announce it to our mailing list. Read it here first! We've got clips! Added this week are interview highlights with Jon Appleton, Peter Beyls, Rhys Chatham, Christopher Koenigsberg, John Levin, and Benedict Mason. These join Louis Andriessen, taken from his AmsterDramm appearance, David Behrman, James Bohn, Craig Bove, Allison Cameron, Kyle Gann, Elma Miller, Pauline Oliveros, Linda Catlin Smith, Ann Southam (whose complete interview is transcribed as well), and the late Peter Van Riper. Our last half-dozen shows haven't been readied for posting yet, but if you haven't listened to recent ones, check out the shows on KalvoNet with guests Kyle Gann and James Bohn, as well as the first of a month's worth of shows called Composers' Wisdom, recalling interview highlights for the past five years of K&D. To hear music & interview bits with your favorite composers, check out our playlists for this fall. These new postings complement our recent shows posted with guests David Cleary, Dennis Darrah, Scott L. Miller, Eric Lyon, Phil Kline, Stephen Smith, and Charles Amirkhanian -- along with some great pix of David, Scott, Eric, Phil, and Stephen. Naturally, there are all the new show essays that go with all these postings. Remember our shows are in RealAudio5/mono/ 28.8, so most of you should be able to listen easily. And finally, we have extended the date for our K&D T-Shirt Design Contest! to December 31 ... we've been so busy that our newsletter hasn't gone out, and we don't want to cheat anyone out of a chance to win this contest! Next week! Peggy Madden is guest co-host for the first of a pair of shows on alternative listening. But she says "Don't call me the New Age queen! ", so we've no idea what she'll bring with her. We're also getting ready some other cool special shows -- one on acousmatics prepped by Ian Chuprun, and more than a dozen interviews we'll be taping in New York City in January. Many of you know that K&D has begun streaming live in ShoutCast as well as RealAudio (with our archives in RealAudio), but you can now listen to a changing Kalvos and Damian New Music Bazaar selected loop on Mp3.com -- 75 or more compositions! Go to http://stations.mp3s.com/stations/1/kalvos_and_damians_new_mu1.html and listen to the special Bazaar in 28.8 streaming MP3 or in hi-fi streaming MP3 for those of you with fast connections. You can also download individual compositions that you enjoy. We'll be changing the four-hour loop every few weeks, so drop by for a listen! We're catching up on our composer interview clips thanks to Damian's heroic efforts. New this week are clips from Craig Bove and Pauline Oliveros. Listen to them as well as four-minute clips of Henning Berg, Bill Gilliam, Daron Hagen, Tom Hamilton, and John Oswald. These join recently posted interview clips with Gary Barwin, Anita Beckmann, Udo Kasemets, Robert H.P. Platz, and James Tenney. Our main server was down extensively the weekend of October 23. We scrambled to post an alternate site, but most of you come to K&D via the main www.goddard.edu/kalvos entrance & couldn't find us at all! In the future, we'll make sure that a second pretty good copy of K&D is available at kalvos.org. So please click and and bookmark this K&D backup link: http://kalvos.org/ We can't promise this backup site will have everything new -- and it certainly won't have any of the sound files -- but it will give you a peek at playlists, composer pages, resources, etc., if our heavy iron goes awry! Our thanks always to Ravi Nielsen at Goddard College, who works above and beyond to keep K&D up and running! We composers may be fanatical about working 24/7, but most sane people don't, so we built our K&D site mirror. Now we can leave him alone on weekends. We're catching up on our composer interview clips thanks to Damian's heroic efforts. Listen to four-minute clips of Henning Berg, Bill Gilliam, Daron Hagen, Tom Hamilton, and John Oswald. These join recently posted interview clips with Gary Barwin, Anita Beckmann, Udo Kasemets, Robert H.P. Platz, and James Tenney. Upcoming on November 13 will be Masahiro Miwa, coming to K&D from Japan as part of his week-long residency at Dartmouth College. Don't miss this amazing electroacoustic/sampling artist! Our main K&D server at Goddard College is still down this morning. You still can't get past this home page. Our apologies, but it's the weekend. Our main K&D server at Goddard College is down tonight. You can't get past this home page -- we're on it! Join us for the broadcasts/cybercast on October 30. We had the unexpected good fortune of taping a round table interview with Belinda Reynolds and Peter Garland, along with the premiere performance of their new works for Essential Music. The interview was joined by composers John Kennedy (also Essential Music's director), Larry Polansky, and Douglas Repetto. This show was produced in cooperation with Dartmouth College's Hopkins Center. Interview clips with Gary Barwin, Anita Beckmann, Udo Kasemets, Robert H.P. Platz, and James Tenney have been posted on their pages. Join us for the broadcasts/cybercasts on October 23 and 30. We had the unexpected good fortune of taping a round table interview with Belinda Reynolds and Peter Garland, along with the premiere performance of their new works for Essential Music. The interview was joined by composers John Kennedy (also Essential Music's director), Larry Polansky, and Douglas Repetto. This show was produced in cooperation with Dartmouth College's Hopkins Center. New shows + guests + clips + tunes! Recovering again, that's us. New shows have been posted on KalvoNet with guests Kyle Gann and James Bohn, as well as the first of a month's worth of shows called Composers' Wisdom, recalling interview highlights for the past five years of K&D. To hear music & interview bits with your favorite composers, check out our playlists for this fall. These new postings complement our recent shows posted with guests David Cleary, Dennis Darrah, Scott L. Miller, Eric Lyon, Phil Kline, Stephen Smith, and the missing first half of the interview with Charles Amirkhanian -- along with some great pix of David, Scott, Eric, Phil, and Stephen. Naturally, there are all the new show essays that go with all these postings. Remember our shows are in RealAudio5/mono/ 28.8, so most of you should be able to listen easily. There are also a multitude of new interview clips and music samples. Previously unclipped composers finally have their say: Louis Andriessen, taken from his AmsterDramm appearance, David Behrman, James Bohn Allison Cameron, Kyle Gann, Elma Miller, Linda Catlin Smith, Ann Southam (whose complete interview is transcribed as well), and the late Peter Van Riper. We're also getting ready some cool special shows -- one on acousmatics prepped by Ian Chuprun, and a pair of alternative listening show with Peggy Madden. A few recent items you may have missed are the special geyser recordings of Steve Gryc and the new links the the mp3.com page of Dennis Báthory-Kitsz. Not enough? Then you can listen to the latest Best of the Bazaar collages from David Gunn or even see how Gwyneth Walker has expanded her list of available recordings. New shows, new guests, new stuff! It's been a wild month! New shows have been posted on KalvoNet with guests David Cleary, Dennis Darrah, Scott L. Miller, Eric Lyon, Phil Kline, Stephen Smith, and the missing first half of the interview with Charles Amirkhanian -- along with some great pix of David, Scott, Eric, Phil, and Stephen. Naturally, there are all the new show essays that go with these postings. There are also a multitude of new interview clips and music samples. We just cybercast/broadcast our show with James Bohn, and upcoming on the weekly live cybercast will be Kyle Gann and David W. Solomons (find exact dates in the latest playlist). And finally, check out the K&D T-Shirt Design Contest!. We've had a great group of visiting composers recently: Eric Lyon, Scott L. Miller, Phil Kline and Stephen Smith have joined us, and James Bohn is coming on August 21 with his music, including BABYlon. We'll be posting the past two months of shows in the next few weeks ... you won't want to miss these! Whoa! We broke 100K! During the first week of August, Kalvos & Damian recorded its 100,000th visitor. Even in these days of that many visitors to CNN in a few hours, it's good to know that the Internet lets us reach out with new music. T-Shirt Design Contest ... and We're the Best New Music Resource! It's finally time for the Kalvos & Damian T-Shirt Design Contest! We need your design in the next two months, and we'll give the best design a bucket of CDs and other goodies. Read the official rules and sketch away. We were delighted to be called "far and away the Web's best new music resource" by Village Voice senior critic (and an author and a composer himself) Kyle Gann. Read the whole story. We loved it! New on our schedule of upcoming guests are Eric Lyon on July 24 and Phil Kline on July 31. Join us live during our Saturday afternoon cybercast! We understand that the latest version of WebTV will finally include RealAudio support. It's been a long time in coming. If you're visiting via WebTV and can't get our RealAudio files to work, contact your supplier and get the latest upgrade! We hardly have time to tell you! New shows have been posted on KalvoNet with guests Kui Dong, Margaret Lancaster, Charles Amirkhanian, Huk Don Phun, and Robert D. Polansky, along with some great pix of Kui, Charles, and Robert and Margaret's sulty CD cover shot. Oh yes ... and a couple of snaps of N.N. und Ähnliche Elemente's special recorded editions in handmade boxes. But that's not all! There are a multitude of new interview clips and music samples, and even some new graphics on our underused graffiti page. Upcoming on the weekly live cybercast will be Dennis Darrah, Kyle Gann, Scott L. Miller, Eric Lyon, James Bohn and David W. Solomons (find exact dates in the latest playlist), as well as some cool special shows -- one on acousmatics prepped by Ian Chuprun, and a pair of alternative listening show with Peggy Madden. A few recent items you may have missed are the special geyser recordings of Steve Gryc and the new links the the mp3.com page of Dennis Báthory-Kitsz. Not enough? Then you can listen to the latest Best of the Bazaar collages from David Gunn or even see how Gwyneth Walker has expanded her list of available recordings. And finally, check back next week as we kick off the K&D T-Shirt Design Contest!. Every five shows, co-host David Gunn produces Best of the Bazaar, a six-minute sound collage that's a wild romp through ten hours of K&D! Our upcoming guests are always listed along with the latest playlist. The complete list of K&D guests, past and upcoming, with links to their pages on our site, is found on the composer index page. 32 remarkable and diverse essays by composers are linked to individual composer pages, and also indexed on the essays page -- where you can also ready all 229 show introductions by David Gunn. Classic Essay by John McGuire Now Available! Finally formatted & ready for your reading: An Electronic Music Project: The Composition of Pulse Music III by John McGuire. Learn how John created his groundbreaking piece and the puzzles he solved more than 20 years ago, when technology was, at best, inconvenient. Complete with the original 27 hand-drawn illustrations. K&D is proud to re-publish this essay after two decades. Get ready: T-Shirt Design Contest! In just a few weeks we'll be announcing our official Design-the-K&D-T-Shirt Contest! We're looking for the coolest & bizarrest (bazaarest) T-Shirt Design. The rules will be simple (gotta say "Kalvos & Damian's New Music Bazaar" and "Your Red Alert for New Music", but anything else is up to you), and we'll be the final darn judges! Prize will be a basket of new music CDs and other goodies. Look for it! Yes, working hard! A special treat has arrived for listeners to the K&D live cybercast: Show IDs created by dozens of our guest composers! We have 20 IDs in queue, and some are pretty cool! Hear Eve Beglarian, Richard Tolenaar, James Grant, Gwyneth Walker, N.N. und Ähnliche Elemente, Eric Honour, Eufrasio Prates, Michael Manion, Matthew Fields and others! And yes, we're working overtime! Nine new shows are posted on KalvoNet! There are no inteviews in this batch -- Kui Dong, Charles Amirkhanian, Margaret Lancaster and Scott L. Miller are comin' up, though -- but include topics such as Ears Over Easy, march music, Wimmintune (two shows), Music of War and Stress, and our ever-popular fundraising segments. These join nine other shows recently posted of interview programs with Calliope Tsoupaki, John McGuire, Michael Frengel and K&D's own Dennis Báthory-Kitsz, as well as a show of new releases, a show on art song, and one filled with short compositions. We've also got new interview clips with Mary Jane Leach, Louis Andriessen, and Dietmar Hippler, a few more segments from The Garden of Cyrus by Eve Beglarian, plus the complete String Quartet No. 2 by Richard Tolenaar. Late last year, six new shows became available on KalvoNet! Hear interview programs with N.N. und ähnliche Elemente and K&D's own David Gunn. We also celebrated Electroacoustic Music Week in November, fretted over political music, invented a new award, and last but not least played the marches, fanfares and dances of impeachment! These new shows join recent show postings of interviews with Mary Jane Leach (with new pix on her page), Steve Gryc (new pix on his page) and Michael Sahl (new commentary by Boudewijn Buckinx on his page), as well as our shows on choral music (a followup to Mary Jane's interview), on composer-rather-than-philosopher John Cage (he wrote great stuff! ), and some birthday folks. See a new pix of David Stevens and more info. Are We Behind, or What? Nine New Shows Just Posted! Yes, we've been working to post nine new shows on KalvoNet! Hear interview programs with Calliope Tsoupaki, John McGuire, Michael Frengel and K&D's own Dennis Báthory-Kitsz, as well as a show of new releases, a show on art song, and one filled with short compositions. We've also got new interview clips with Mary Jane Leach, Louis Andriessen, and Dietmar Hippler, a few more segments from The Garden of Cyrus by Eve Beglarian, plus the complete String Quartet No. 2 by Richard Tolenaar. And a special treat coming soon for listeners to the K&D live cybercast: Show IDs created by dozens of our guest composers! Nine new shows are available on KalvoNet! Hear interview programs with Calliope Tsoupaki, John McGuire, Michael Frengel and K&D's own Dennis Báthory-Kitsz, as well as a show of new releases, a show on art song, and one filled with short compositions. Our apologies for the delay in posting playlists and other goodies. New pages and revisions are up soon. Another half dozen shows will be available on archived audio as well. We had work, flu, and just plain overwhelmification! Note: Students wishing to keep our composer resources and and music resources updated shoudl contact us at kalvos@maltedmedia.com.